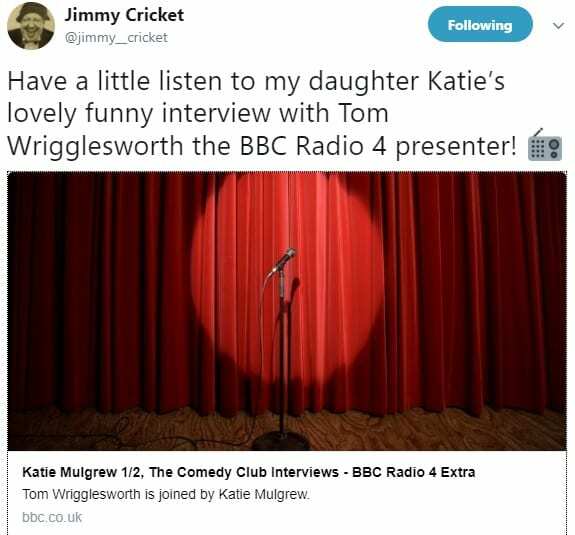 Jimmy Cricket’s comedian daughter Katie Mulgrew featured on BBC Radio 4 Extra’s The Comedy Club Interviews series recently. Katie (pictured below right), who has performed three solo stand-up shows at the Edinburgh Fringe Festival, was interviewed by BBC presenter Tom Wrigglesworth. Her famous dad posted on Twitter saying it was a “lovely funny interview”. She won the inaugural 2015 Liverpool Hope play-writing prize with her play Omnibus. It was staged at the Unity Theatre in June 2017 in a co-production with the Liverpool Royal Court to rave reviews. Find out more about Katie here. Jimmy Cricket did a spot of promoting at this year’s popular Edinburgh Festival Fringe – but not for his own show. The famous entertainer was there primarily to support his daughter, comedienne Katie Mulgrew, and that included some baby-sitting. Katie, below right, had her own show at this year’s festival fringe called Saboteur. 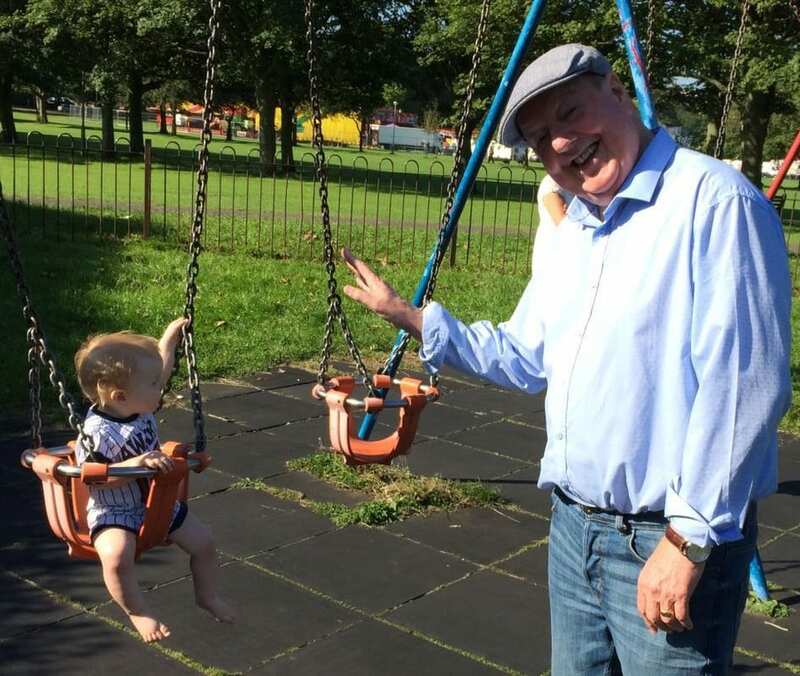 Jimmy, 70, not only popped along to see her act, but was present in Edinburgh to help look after his grandson, Jim, who is Katie’s nearly one-year-old baby. And he ended up plugging her performance in a brief bit of his own stand-up at the Fast Fringe – as he told readers of his latest column in the Lancashire Evening Post. 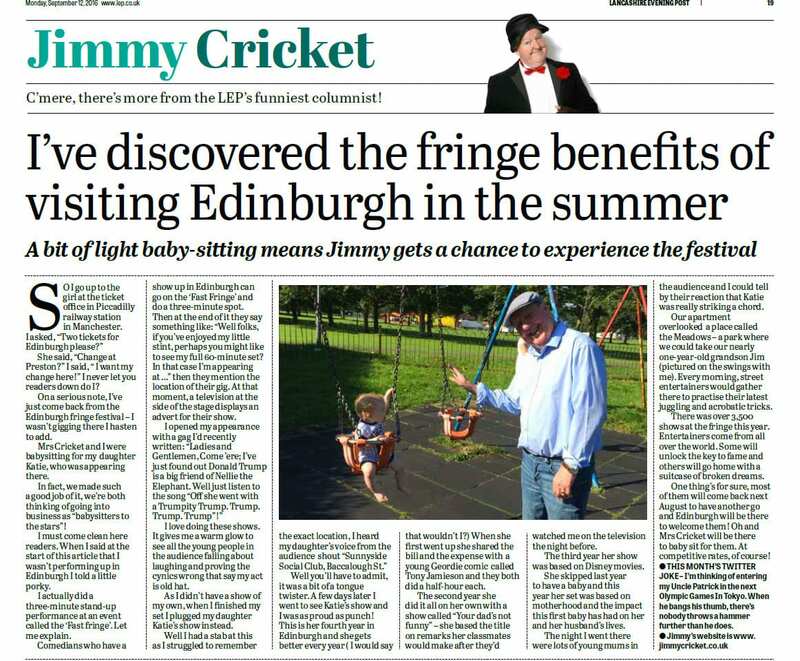 “Comedians who have a show up in Edinburgh can go on the Fast Fringe and do a three-minute spot,” explained Jimmy. “Then at the end of it, they say something like: ‘Well folks, if you’ve enjoyed my little stint, perhaps you might like to see my full 60-minute set. In that case, I’m appearing at…’ then they mention the location of their gig. “… As I didn’t have a show of my own, when I finished my set I plugged Katie’s show instead. “Well, I had a stab at this but as I struggled to remember the exact location, I heard my daughter’s voice from the audience shout ‘Sunnyside Social Club, Barraclough Street’. “Well, you’ll have to admit it’s a bit of a tongue twister. 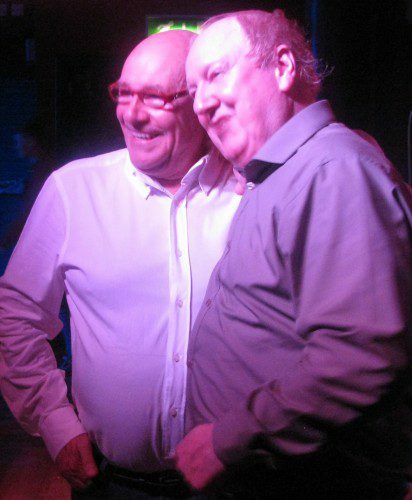 Jimmy Cricket recently returned from a trip to this year’s Edinburgh Festival Fringe. The famous entertainer, 70, was there primarily to support his daughter, comedienne Katie Mulgrew. 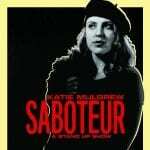 Katie had her own show at this year’s fringe festival called Saboteur (see poster below right). Jimmy not only popped along to see the show, but was present in Edinburgh to help look after his grandson, Jim, who is Katie’s nearly one-year-old baby (bottom picture). Clearly performing a stand-up comedy show at the fringe festival, as well as all the other promotional activities needed to build interest in a show, means the support for Katie was very welcome. Jimmy even did a spot of promoting to help attract an audience for Katie’s show! Edinburgh is naturally a fun place to be around during August with the festival in full blast. 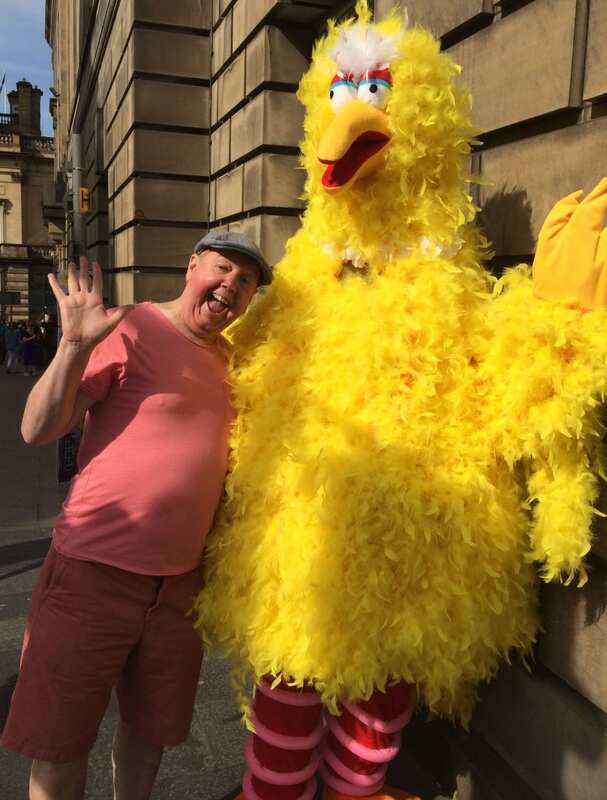 While in Edinburgh, Jimmy went to see his friends, the swing band called the Jive Aces, who were at the festival as well. He also appeared on the daily Fast Fringe show and capped off his visit by bumping into Big Bird, based on the character from the children’s television show Sesame Street (top right)! 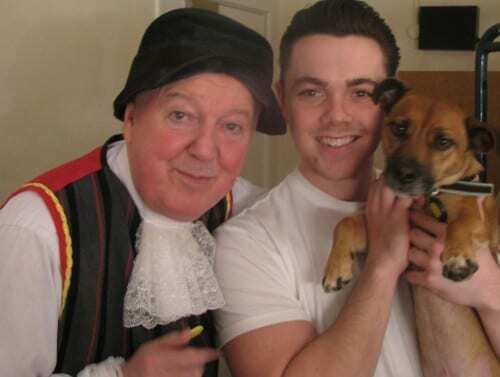 Jimmy Cricket has taken part in a televised comedy marathon spectacular. The Northern Irish funnyman was among 40 comedians to perform in the eight-hour overnight show (9pm-5am) at the Edinburgh Festival Fringe 2012 on Friday 17 August. And Jimmy did not take to the stage until 2.50am! The show was broadcast throughout the night on the BBC digital channel and BBC3 has edited the event down to a one-hour highlights package which it will screen three times, the first at 9pm tomorrow (Friday 31 August). Watch a preview trailer of the programme here, though it is accompanied by a warning about strong language (none from Jimmy, we hasten to add!). See the line-up of comedians and Jimmy’s profile. Jimmy was also at the world-famous Edinburgh Festival to team up with one of his contemporaries, Mick Miller, as part of their short tour around the UK which also includes Darlington, Preston, Chester, Sheffield and Manchester. The ‘Jimmy & Mick 2012 UK Tour’ show in Edinburgh was at a venue called the Ace Dome, which is among several Fringe venues run by the Pleasance company – one of the Fringe’s key venue organisers. 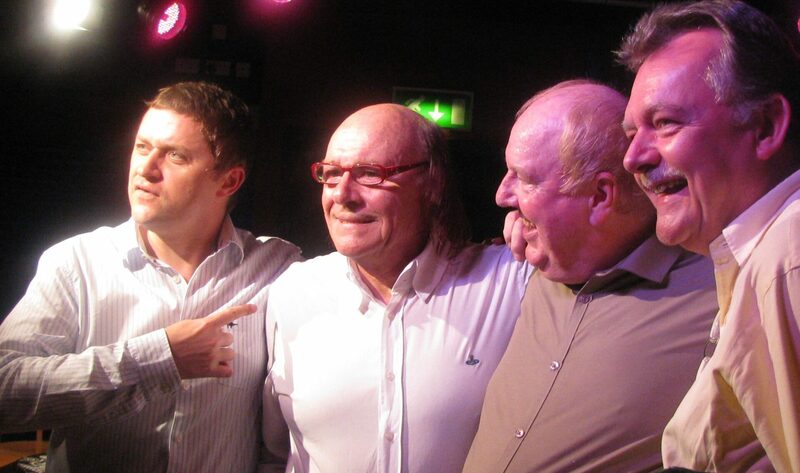 Jimmy said: “I really enjoy working with Mick and feel we complement each other’s style of comedy. 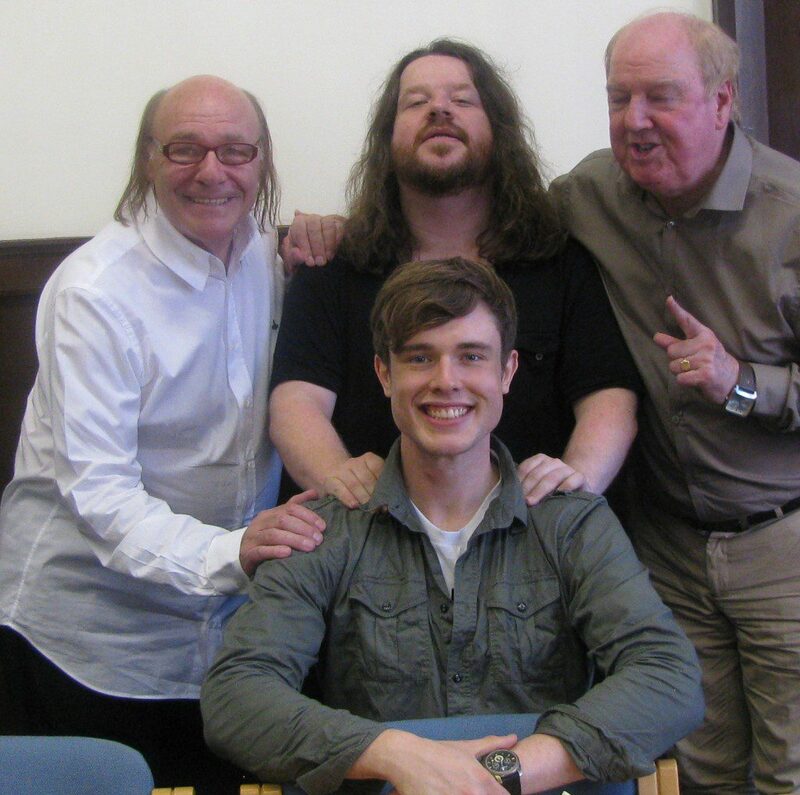 During his visit to the Fringe, Jimmy also took part in a podcast with Mick Miller, which was hosted by the young comedy double act Peacock and Gamble. And after his Ace Dome show with Mick, Jimmy travelled over to the main Pleasance complex to take part in that evening’s version of the Horne Section – hosted by the comedian Alex Horne. Jimmy ended his set on this show with a rendition of ‘Tequila’, which he played on his saxophone with Alex and his band providing the accompaniment.